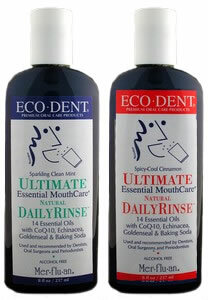 Eco-Dent Ultimate Daily Rinse and Oral Wound Cleanser is the premium natural mouth rinse product anywhere. Formulated with no alcohol and with an effective blend of essential oils and herbs, this product is perfect for both daily use as a rinse, or to cleanse and soothe minor mouth irritations or canker sores. The therapeutic level of baking soda provides effective soothing and cleansing action while helping to neutralize mouth acids. This rinse is the most highly recommended mouth rinse product and we know that once you try it, you won?t be disappointed. Available in fresh Mint or tangy Cinnamon flavors. Adults and children 2 and over, Swish 2-3 capfuls in mouth over affected area for at least 1 minute. Expel. Use up to four times daily or as directed by a dentist or doctor. Supervise use by children under 12. Children under 2: Consult a dentist or doctor. Daily Use: To improve daily oral hygiene, rinse or gargle for 20-30 seconds with 1 capful after eating or brushing. Use as needed for sparkling clean breath and a tingly fresh mouth. Temporary Use as an Oral Wound Cleanser: Indications: Ultimate Essential MouthCare Rinse may also be used on a temporary basis to cleanse and soothe canker sores and minor wounds or gum inflammation resulting from minor dental procedures, dentures, orthodonic appliances, accidental injury, or other irritation of the mouth and gums. Warning For Temporary Use: Severe or persistent oral distress requires professional attention! If sore mouth symptoms do not improve in 7 days, or if swelling, rash or fever develops, see your dentist or doctor promptly. Keep this and all drugs out of the reach of children. In case of accidental ingestion, seek professional assistance or contact a poison control center immediately. Other ingredients: Water, Castor Bean Oil (sulfated), Menthol, Peppermint Oil, Anethole, Echinacea Extract, Goldenseal Extract, Stevia, Tea Tree Oil, CoQ10, Essential Oils of Orange, Lemon, Sweet Fennel, Anise, Geranium, Bergamot, Fougere, Lavender, Rosemary, Basil, and Rose. ULTIMATE MOUTH CARE! Ultimate Essential Mouth care Rinse is a potent, time tested blend of 14 Essential Oils, plus Echinacea, Goldenseal, CoQ10, and Baking Soda-important oral health ingredients, both for daily use and when suffering from canker sores, minor wounds, or gum irritations. Vibrant, natural flavors cleanse & refresh your entire mouth. No saccharin, glycerin, sorbitol, or sugar. Nothing artificial. 100% Cruelty Free.